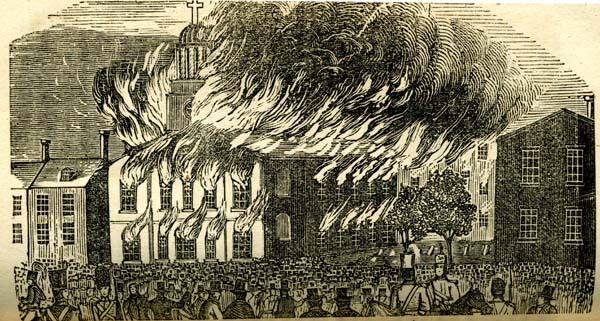 St. Augustine’s Church in Philadelphia set on fire by a Nativist mob in May 1844. …I now hold a respectable situation in this city as a custom-house officer….I have the honor of being appointed through my own merit. We have in the Custom House 200 officers and there are only three Irishmen in that office and I am one of those. I owe to that the stand that I have taken the political field. I am a Democrat out and out and take the platform for the cause against monarchy and aristocracy. I am for free Republican government. …our city has been nothing but the scene of bloodshed. The origin of this awful scene was respecting a party of native American* citizens forming themselves into a body to deprive all foreigners of their rights and privileges guaranteed to them by the constitution. And they pitched their spite upon the Irish Roman Catholics and at one of their meetings the Irish rose against them and there was a great number shot on both sides. There were a great many Roman Catholic churches and nunneries burned in the city and as many as fifty killed in one riot. There were 20 cannons discharged in one night by the military. *by “native American”, Smith was referring to white native-born citizens. Robert Smith was one of three Irishmen at an office of 200 people. What do we know from the letter how he felt about that experience? Based on what he shares, how might you have felt in his situation? How can you find out whether his experience was reflective of the larger story of 19th century Irish immigration? What does this letter suggest about the ways Irish newcomers were received in Philadelphia? Based on what you know about the experiences of immigrants today, what is unique in Smith’s story? How is it similar to stories of newcomers today?